When you first think of Oktoberfest you think amazing chaos, people from all over the world, lederhosen, pretzels and so much beer. Well that’s all very true. But with Oktoberfest also comes pre-planning, booking tables (almost a year in advance), paying huge hotel/hostel rates and securing that perfect outfit for the occasion. 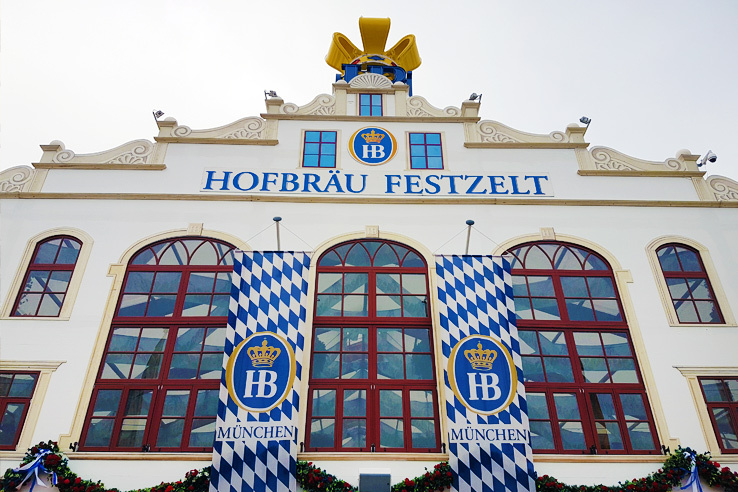 But what we’ve found is that a last minute trip to Oktoberfest is NOT impossible. 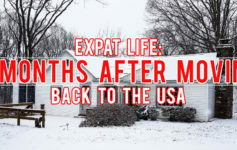 You don’t have to wait in line for hours on end, cram into standing room only tents or feel like you need to drop hundreds and hundreds of dollars on a hotel room. This is KEY in your last minute getaway. Sure, you can go on the weekend and fight the crowds, but why? When you go during the week, your chance of finding tables to sit at is WAY higher than on the weekends. And it won’t affect your experience at all. Trust me, we went on a Wednesday, made PLENTY of new friends and prosted all day long. It actually was the perfect size crowd. Enough to keep the day festive, but not too many people where you can barely squeeze through the grounds. Get to the tents by 10am sharp. Getting to the tents early is SUPER important. If you want to increase your chances of getting a table, definitely get there by 10am when they open. That way, you’ll have nothing to worry about because you’ll be the very first ones there. 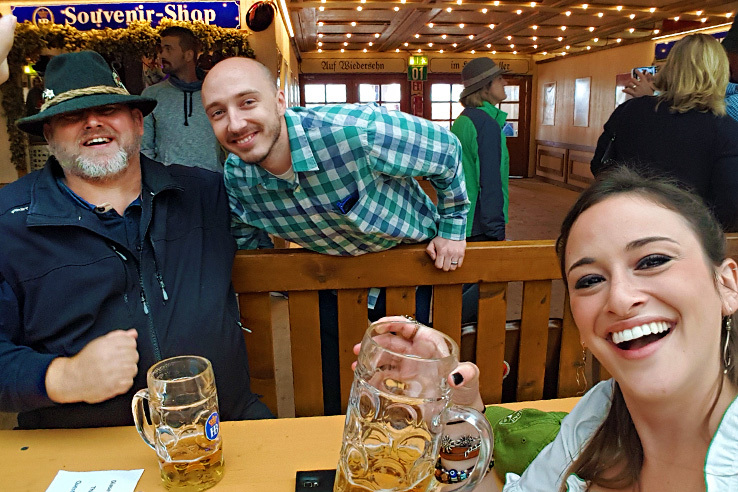 We were literally the first customers in the Augustiner tent, but with beer flowing and pretzels being passed around, we couldn’t have been happier. Plus, it gives you time to get settled and know the routine, so by the time ALL the crowds roll in, you’ll be an Oktoberfest pro. Because we started our day at 10am, we were able to visit 4 of the biggest tents without any problem of getting in. Augustiner-Festhalle (our first stop), Hofbräu Festzelt (the clear favorite), Winzerer Fähndl and Löwenbräu-Festhalle (our last stop = fuzzy memories!) Trust me, those 4 were MORE than enough! It will save you SO MUCH MONEY and will allow you to find a last minute hotel or hostel with no problem at all. Hotels (and even hostels) can cost 300 euros per night. Alleviating that crazy cost is instrumental to your Oktoberfest experience. Yes, you could forgo booking in advance and just pop into hostels when you get there, but if you’re anything like us, not knowing if you have a place to sleep just doesn’t fly. 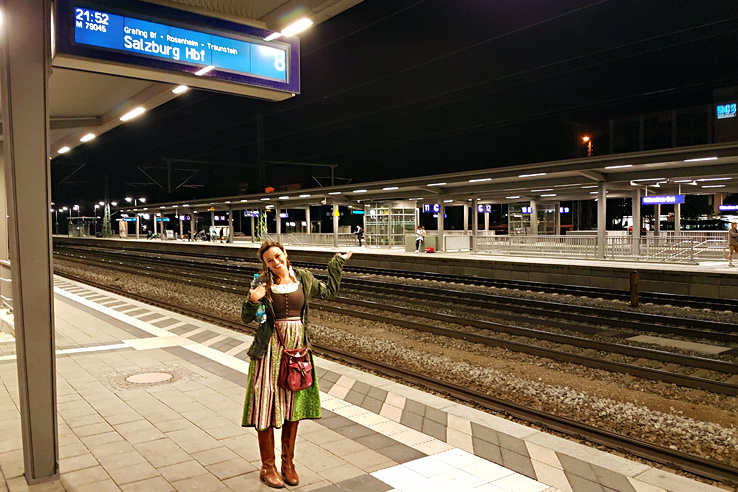 The train system in Germany, and in Europe in general, is unreal. So staying outside of Munich is not as much of a bummer as it sounds. You can stay 15 minutes outside the city, 30 minutes or even further, and it’s as simple as hopping on a train ride home at the end of the night. We went up for the day from Salzburg (and Salzburg is almost 2 hours away!). It was SUPER easy. When you don’t have to change trains, the journey is simple, no matter how far. Find any of the stations along Deutsche Bahn (German rail line) and look into staying there instead of the center of Munich. Trains run all night with some of the later ones leaving at midnight or later. With tents closing around 10:30pm and rides ending around 11:30pm (…and having spent the entire day drinking), you’ll be ready to go by then. You can even make the journey again the next day if you’re looking for round 2. BUT if you’re more badass than I’m giving you credit for or if you just lose track of time, no problem! 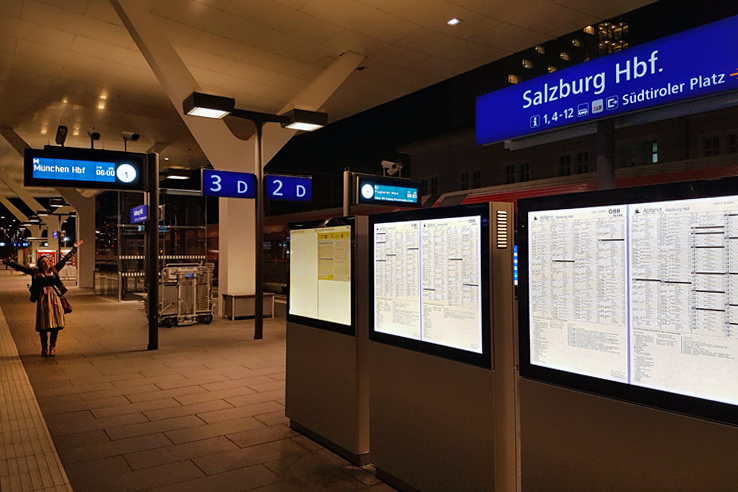 Some of the first trains are at 6am or earlier, so pull an all-nighter and head back to your hotel early. 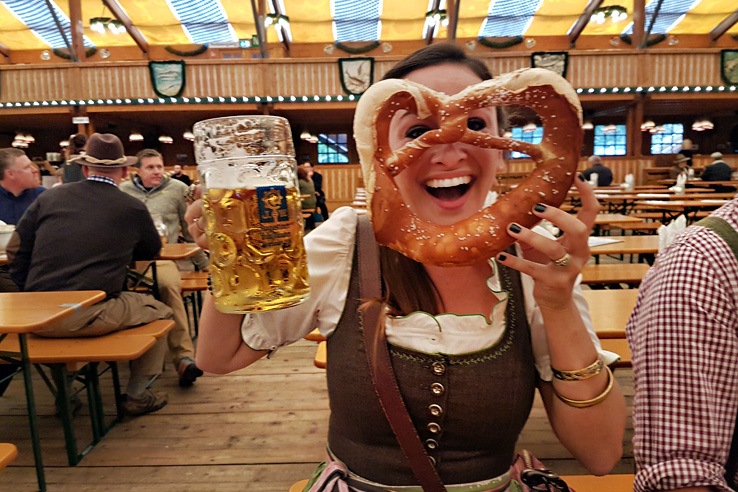 Staying outside of Munich is the most effective method for making your last minute trip to Oktoberfest smooth and reasonable in cost. Official outfit vs. Souvenir outfit or No outfit at all? How festive you get for these German beer festivities is completely up to you. But you ARE going to a place where everyone is dressed up and decked out, so why not? 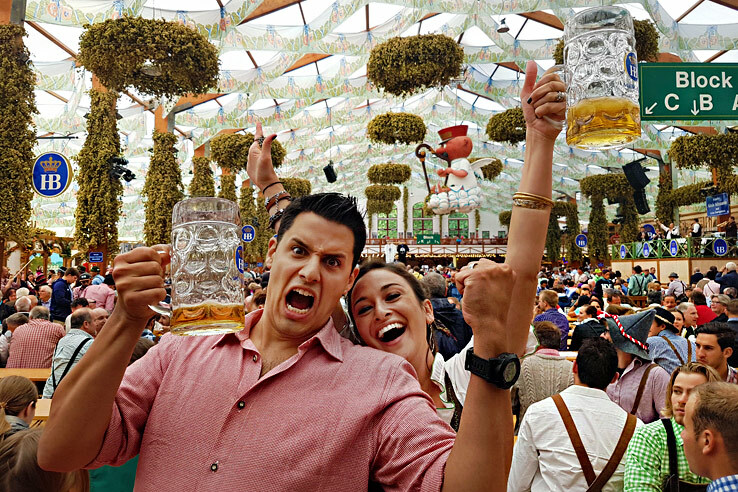 ‘When at Oktoberfest’ should be the theme of your trip. Go wild and get into it. That’s when it’s the most fun! You can find a dirndl (Traditional dress for ladies) and lederhosen (traditional outfit for men) at all sorts of price levels. The lowest prices I’ve seen for dirndls is 39 euros for OK quality. Assuming you don’t plan to wear it too often. OR you can invest 40-50 more and get a well-made dress if you’ve got plans to wear it throughout the year. Lederhosen are tough to find cheap, but 50 euro lederhosen DOES exist. Since it’s traditionally made out of leather, most will average about 200 euros, but if you sacrifice the material, you can definitely pull off cheaper hosen. C&A is a great place to buy the cheapest lederhosen and dirndls, and those should be easily accessible to most places in the area, even outside the city. There’s definitely more than few in Munich. Click here for the locations! If you’re not staying in the city, try to get your gear ahead of time. Most villages and towns in Bavaria and in Austria have lederhosen and dirndl shops. If not, the village next door will definitely have one. 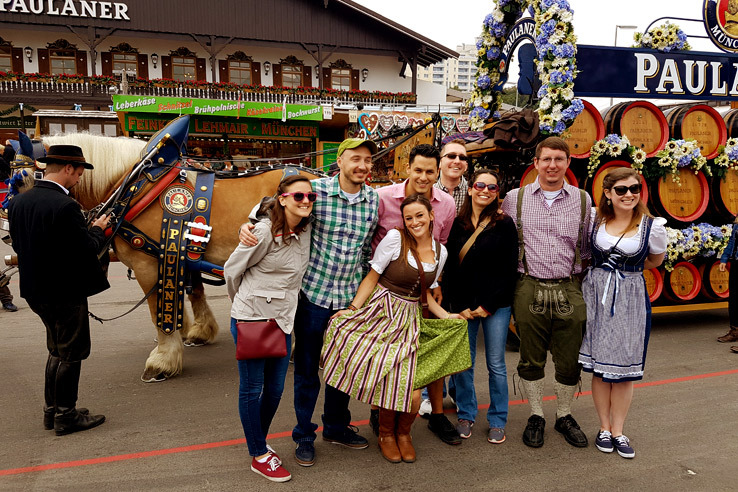 Either way, traditional or souvenir, your tracht is all part of the fun! 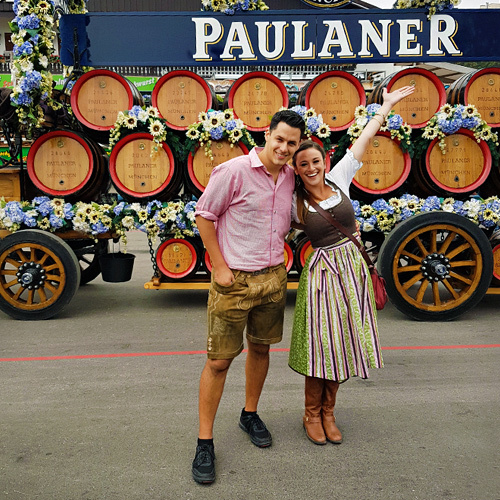 To learn more about how to find the perfect outfit for the occasion, read about it here – How to Buy an Outfit for Oktoberfest. We’ll walk you through your shopping experience. 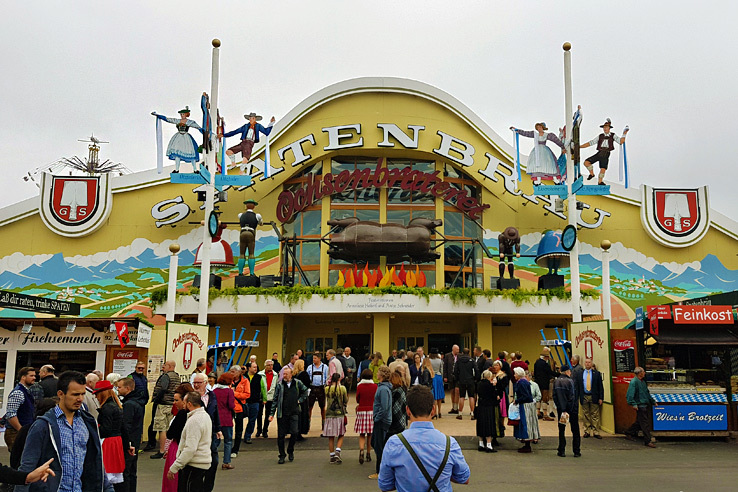 10 euro beers (+2 euro tips) and endless German food in the tents can get pricey all day long. To help save money, share a pretzel or two whenever you sit down. The pretzels are about 5 euros (2016) vs meals that cost double or more. That’s exactly what we did. After we were beer and pretzel’d out, we got snacks outside at the carnival, but mostly splurged on an epic dinner after we left. It was actually nice to get out and eat something affordable away from the craziness. Especially after drinking since 10am. Oktoberfest: There’s just nothing like it! Everything you’ve heard about Oktoberfest is true. People from all over the world, sitting with complete strangers. Prosting and singing like they’ve known each other for years. It just warms your spirit. We became friends with teenagers, people in their 60s. Made friends from Australia, the Netherlands and Germany (and I’m sure so many more.) And we might never see them again. But that’s okay! We have those memories. We have those pictures and funny videos. So they’ll always be a part of our story. And OH what a story it was! Maybe it’s the music, maybe it’s the beer or maybe it’s the shared goal of getting drunk and having a good time. 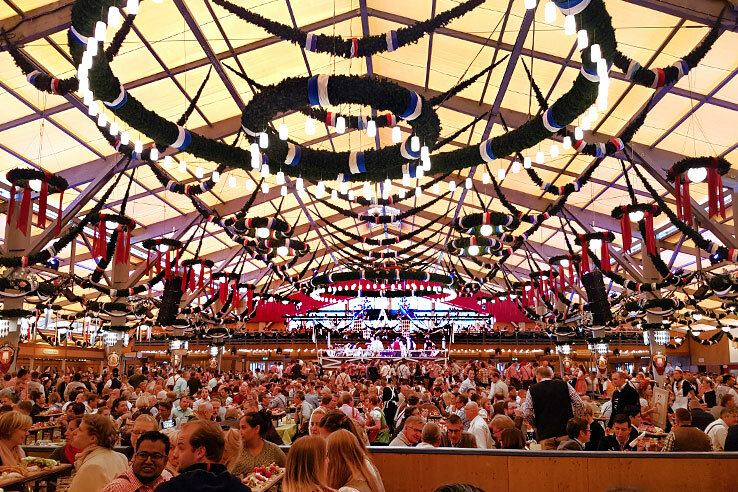 Either way, there is simply no place like Munich’s Oktoberfest. For us, it exceeded every expectation we’ve ever had. After all, what do you get when you combine good people, delicious food, a never ending flow of beer and carnival rides? !